The word curator comes from the Latin curare, meaning an overseer, manager, keeper or guardian: someone who takes care of things. Of course, these ‘things’ can also be memories and moments in time; small stories evoking a greater narrative. A curator is also a detective, sifting clues and finding links to tell these stories. Thanks to Trove, the Australian War Memorial, good old Google and some New Jersey librarians, I was able to decipher the story of one of our recent acquisitions. It is a small story, but perfectly formed. On 1 April 1946 Prime Minister Ben Chifley wrote to Mr and Mrs F.H. Silence of 480 Ridgewood Road in Maplewood, New Jersey. 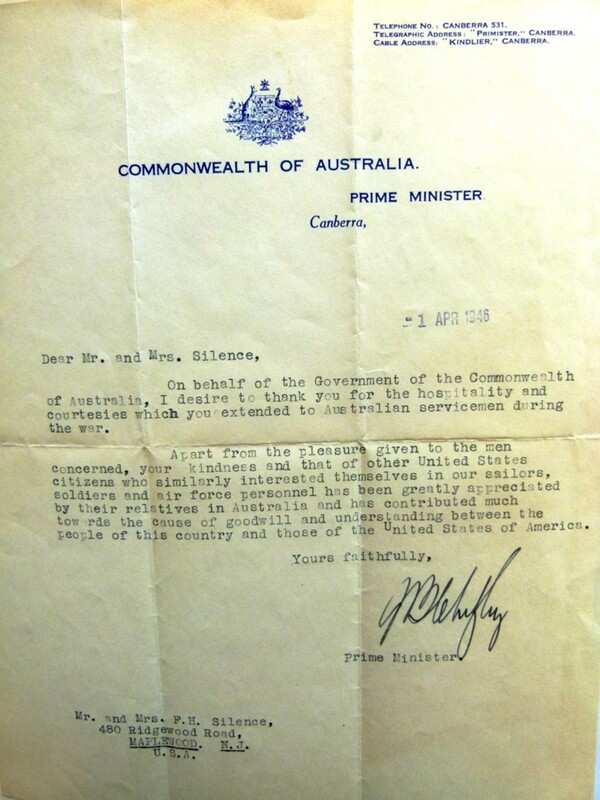 ‘On behalf of the Government of the Commonwealth of Australia,’ he wrote, ‘I desire to thank you for the hospitality and courtesies which you extended to Australian servicemen during the war.’ Who were the Silences, and what exactly did they do? During the Second World War HMAS Australia supported United States naval and amphibious operations throughout the south and southwest Pacific Ocean. It took part in the Battle of the Coral Sea, the Guadalcanal Campaign and the liberation of the Philippines. During actions at Leyte and Lingayen Gulfs in the Philippines the ship was hit by five terrifying kamikaze attacks that killed or injured more than 200 Australians and, of course, the Japanese pilots. The Australia’s commanding officer, Captain Emile Dechaineux, was among those who died of their wounds. So when Australia sailed into New York City in June 1945 en route to England for repairs, its war-weary crew received a warm welcome. ‘The ship’s stay in New York was marked by … lavish and wholehearted entertainment … and was very much appreciated by all hands’, reported Australia’s new commanding officer, Captain Jack Armstrong. A portion of the ship’s company and band marched from Central Park down Fifth Avenue to a colourful ceremony at the Rockefeller Centre. Dinners, dances and sight-seeing tours were organised for the sailors by clubs and community organisations. Among the organisers were Frederick and Mildred Silence. An obituary in the Maplewood and South Orange News-Record reveals that Mr Silence was active in his church and in various civic organisations. Born in Brooklyn, he was a coffee importer in New York City for 25 years and was at one time the President of the Coffee and Sugar and Cocoa Exchange, located in the wonderful flatiron Beaver Building in the financial district in lower Manhattan. This was within walking distance of where HMAS Australia docked, at the No. 26 Wharf in the Hudson River on the west side of Manhattan (now part of the Hudson River Park). The Ship’s Company behaved with great decency and restraint, and I was very proud to hear quite unsolicited testimonials to their good behaviour from all who came into contact with them. We had only one case of drunkenness in the streets and one case of fighting when two of our men resented slurs cast on Britishers by U.S. Soldiers. I think this was quite remarkable as few Australian sailors were permitted to buy their own drinks and were often embarrassed by the excess of liquid hospitality offered. Mildred Silence’s story has yet to be revealed. However, it is nice to think of her and husband Fred enjoying the hospitality returned by Captain Armstrong and his officers. The Australians hosted several luncheons, teas, receptions and parties on board the ship, including a cocktail party on the quarterdeck to thank those who had arranged the entertainment. One can imagine Mildred in her frock and gloves, curls and pearls on a fine summer afternoon. Perhaps she was happy with the knowledge of the Allied victory in Europe and the relative safety of New York City in the continuing war with Japan. This knowledge was literally brought home by a battle-scarred ship and crew from the other side of the world. Frederick Silence died in a West Orange nursing home in 1988, aged 91. Mildred died in 1982. 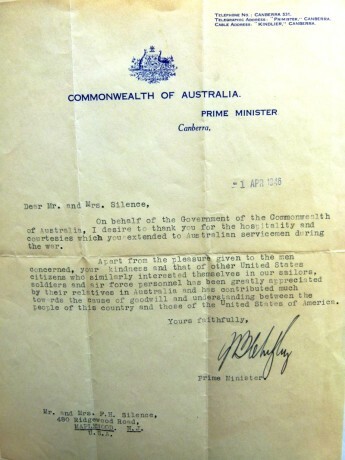 ‘Apart from the pleasure given to the men concerned,’ Chifley wrote to them back in 1946, ‘your kindness and that of other United States citizens … has been greatly appreciated by their relatives in Australia and has contributed much towards the cause of goodwill and understanding between the people of this country and those of the United States of America.’ Prime Minister Chifley’s letter is a small indication of how the war transformed Australian-US relations. The alliance forged between the two nations continues to influence foreign policy and regional security today. The letter will go on display in our Prime Ministers of Australia gallery in February 2016. Ben Chifley’s letter to Fred and Mildred Silence.